Emma Goldman Quotes, i.e. searching for Emma Goldman quotes. If yes, now you don't need to search for them anymore. 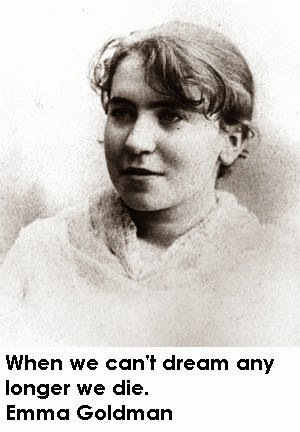 As here I have compiled down some of the best Emma Goldman quotes for you. Just hope you will like the quote compilation and learn something inspiring from Emma Goldman quotes. No real social change has ever been brought about without a revolution - Revolution is but thought carried into action. Every effort for progress, for enlightenment, for science, for religious, political, and economic liberty, emanates from the minority, and not from the mass. Love is it's own protection. war is organized murder and nothing else. Every society has the criminals it deserves. Ask for work. If they don't give you work, ask for bread. If they do not give you work or bread, then take bread. Give us what belongs to us in peace, and if you don't give it to us in peace, we will take it by force. The idealists and visionaries, foolish enough to throw caution to the winds and express their ardor and faith in some supreme deed, have advanced mankind and have enriched the world. Patriotism ... is a superstition artificially created and maintained through a network of lies and falsehoods; a superstition that robs man of his self-respect and dignity, and increases his arrogance and conceit. No one has yet realized the wealth of sympathy, the kindness, and generosity hidden in the soul of a child. The effort of every true education should be to unlock that treasure. Let us not overlook vital things, because of the bulk of trifles confronting us. Idealists foolish enough to throw caution to the winds have advanced mankind and have enriched the world.